update: Like a doof, I thought this was from my Spotmatic when it was from my Retina IIc. I fixed the description above but not the text below. The comments all refer to the Spotmatic so this is a right mess. Whatever. Good discussion. Here’s one more photo from the Spotmatic F after yesterday’s review. I’m sure, however, that this won’t be the last photo from the SPF as it is a delightful camera and I’ll use it often. I can see me having one TLR, one rangefinder, one P&S. 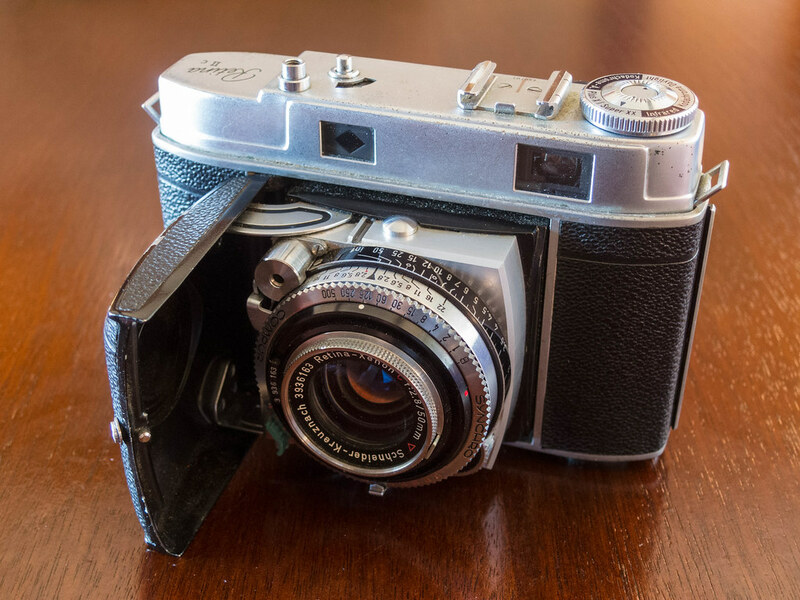 Well, maybe two rangefinders: my Canonet QL17 and one of my Retinas. But I will not be able to get below seven or eight SLRs. Gosh, I love SLRs. I can’t imagine selling off my Nikons F2 and F3; my Nikon N90s; my Canon A2e; or my Pentaxes KM, ME, and Spotmatic F. I am likely to keep a Canon FD-mount body and a Minolta MC/MD-mount body because you never know when you’ll stumble upon an interesting lens for them cheap. But even then, this will cause me to part with some cameras that I simply adore. My Konica Autoreflex T3. My Miranda Sensorex II. Oh, I could list a dozen more, but you get the point. Given that camera reviews remain very popular on my blog, and given that I really enjoy the experience of trying a new-to-me old camera, I can’t see myself not buying more. If I don’t become 100% the photographer I could be because I didn’t pare down to one SLR, one TLR, etc., then so be it. The journey will have been worth it. But I have at least implemented one rule: for every camera I buy, one camera has to go. Period. 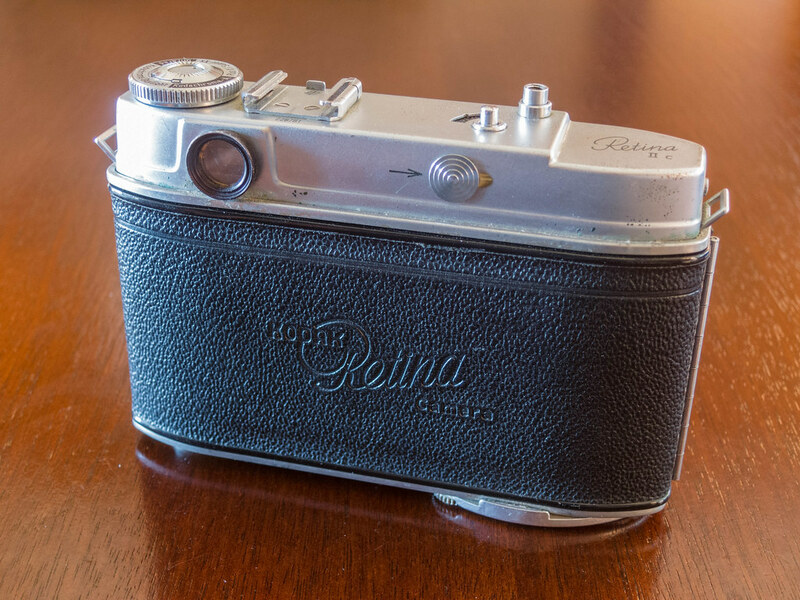 You have to wonder what the point of the Kodak Retina IIc was, given that it replaced the very similar Retina IIa in 1954. 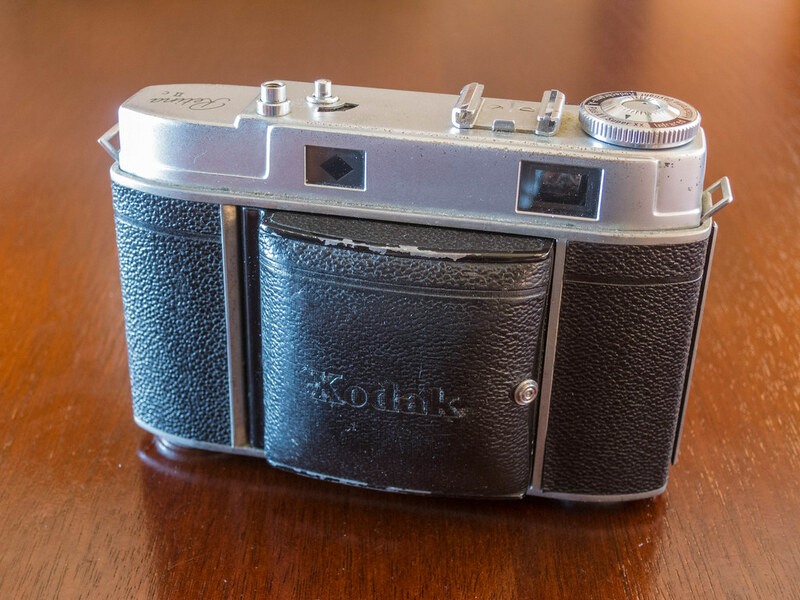 Both are German-made compact folding rangefinder cameras for 35mm film, with fixed 50mm lenses, leaf shutters, and fine lenses. The IIc differs from the IIa in several ways, but two stand right out. Its winder is on the bottom plate rather than the top. And its 50mm lens lets in less light, with a maximum aperture of f/2.8 compared to the IIa’s f/2. But that front lens element interchanges. It just twists right off, and available 35 and 80mm front elements twist right in. Confusingly, some IIa bodies had Schneider-Kreuznach lenses while others had Rodenstock lenses. Schneider front elements wouldn’t mount on the Rodenstock rear elements and vice-versa. That’s why the IIc existed: to move the Retina line toward being a system camera. Because what system camera doesn’t have interchangeable lenses? Retina accessories already existed out the wazoo: finders, meters, auxiliary lenses, lens hoods, flash holders, even stereo attachments. That’s not all that changed. The body was rounder. The front-cover latch moved to the edge where the cover opens. Its main shutter bearing and cocking rack might have been made more robust. The IIc also changed the way you set exposure from straight aperture and shutter-speed settings to exposure values (EVs). An EV number represents an exposure level. EV 15 is f/8 at 1/500 sec. — and f/11 at 1/250, f/16 at 1/125, and so on. And EV 14 lets in a “stop” more light than EV 15. The IIc assumes you can convert light to EVs in your head, or you have a meter with an EV scale. Either way, you set EVs along the bottom of the IIc’s lens barrel. Pull down the metal lever and move it until it points to the right EV. You might have to adjust aperture or shutter speed to access some EVs. From there, turning the knurled dial moves the Retina through all the aperture/shutter-speed combinations that represent that exposure level so you can get the depth of field you want. The meter app on my iPhone can output EVs, so I used this system. Except for the EV scale being awkwardly placed on the camera, it worked remarkably well. EV 13½? Click it into place and shoot. Nothing to it. On the other hand, the IIc’s EV system complicates setting aperture and shutter speed directly. So if you aren’t using EVs you will find this camera to be frustrating. Get a IIa. The IIc still has all the usual Retina quirks, chief among them being that you can’t close the cover until you set focus to infinity. After you’ve done that, to close the cover you press in the buttons on the top and bottom of the lens board simultaneously. The other quirk is that the frame counter counts down, and when it reaches one, the Retina stops winding. So set that counter when you load the film! Or do what I did: forget to do it, shoot until you hit one, press the button next to the frame counter, and scoot the slider on the camera back repeatedly until you get enough frames to finish the roll. The winding tension at the end of the roll will tell you you’re done. What’s not quirky is the shutter’s 1/500 sec. fastest speed. It makes the Retina IIc quite versatile. Someday I ought to drop in some fast film and shoot Sunny 16. But for my test roll I used good old Fujicolor 200. I happily shot the rest of the roll, but when the film came back from the processor only the first frame, above, was exposed. Such a disappointment! I opened the camera back and fired the shutter at all speeds. I watched as it let in light every time. And the winder was clearly turning the takeup spool properly. The negatives showed no sign of sprocket-hole tearing. 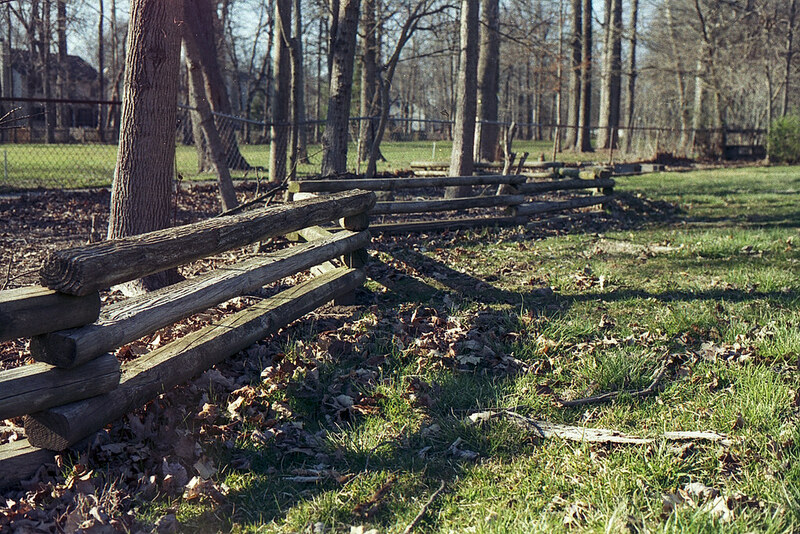 So I shrugged and loaded another roll of film, this time Kodak Gold 200. I blew through most of the roll in twenty minutes in my front garden. 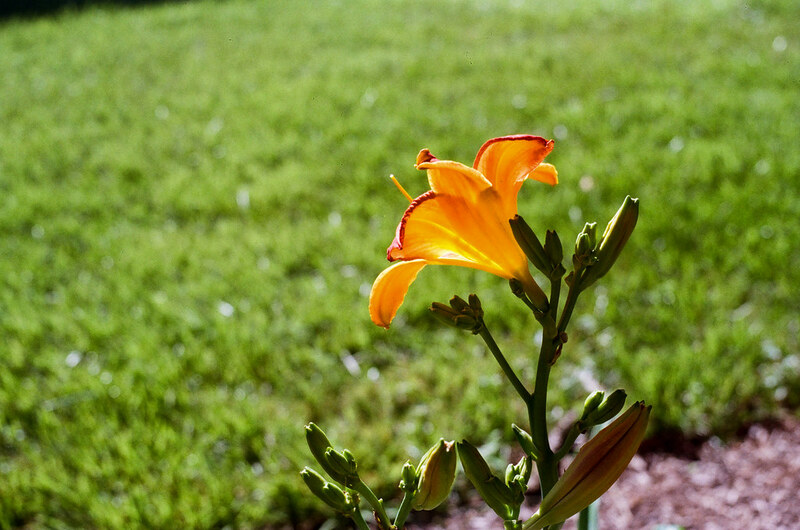 I shot these around the 4th of July, when my flowers were really starting to go to town. 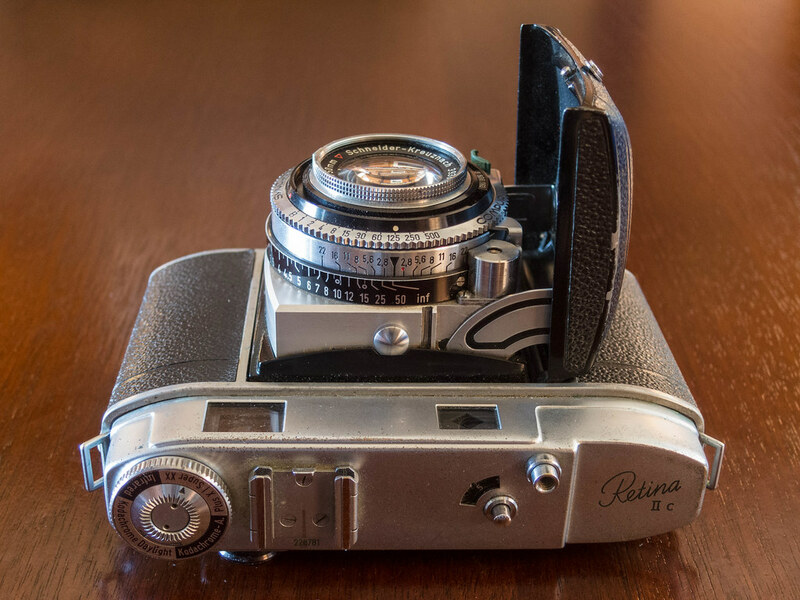 Busy subjects like this one did tax my IIc’s rangefinder. I wish it were brigher; it might have been when it left the factory. But it’s also small. These conditions made it hard for my middle-aged eyes to focus on busy subjects. It’s easy enough to focus when you back up and want lots of depth of field, however. My hosta were all in peak bloom when I shot this. I’m ambivalent toward hosta, but I have a lot of them in my yard because Verna, the woman who built this house, planted them. I took the IIc over to Juan Solomon Park to finish the roll. 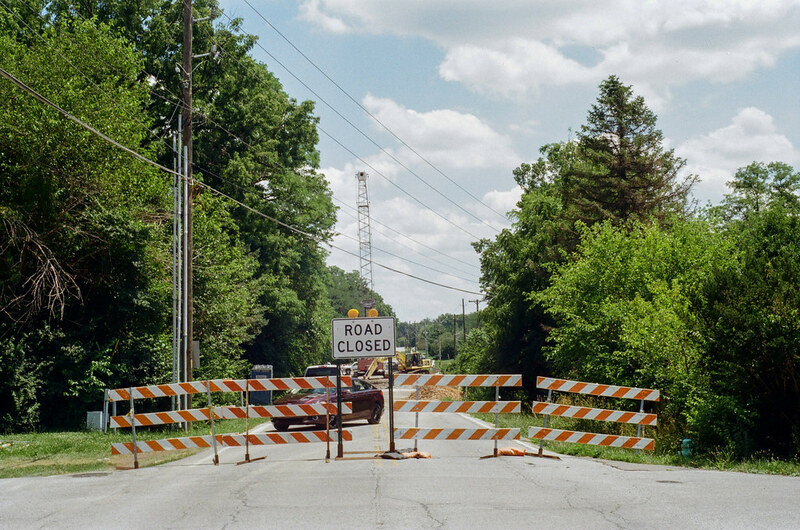 The city is replacing a bridge on one of the roads I take to get there. 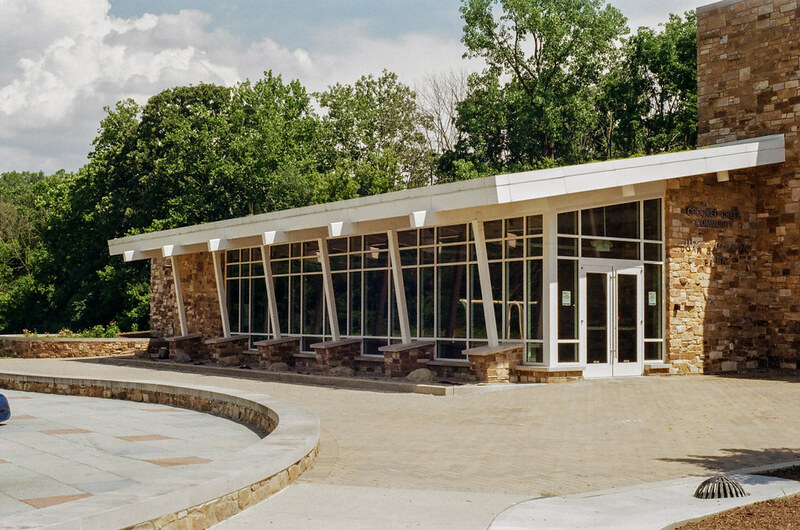 I’ve photographed this building on the park grounds many times because it is so handsome. 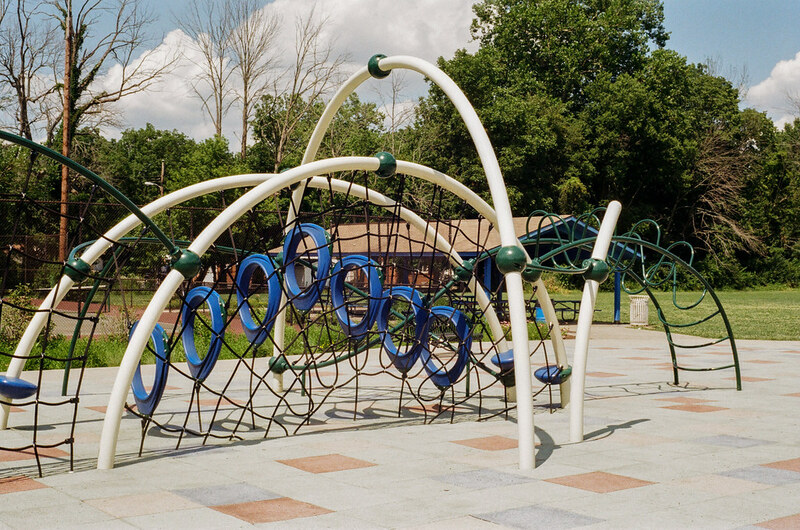 This park has been a frequent subject because of its color and its varied shapes. This neighborhood is fortunate to have such a wonderful playground. It’s much nicer than the playground that was here when my sons were small and we used to visit all the time. 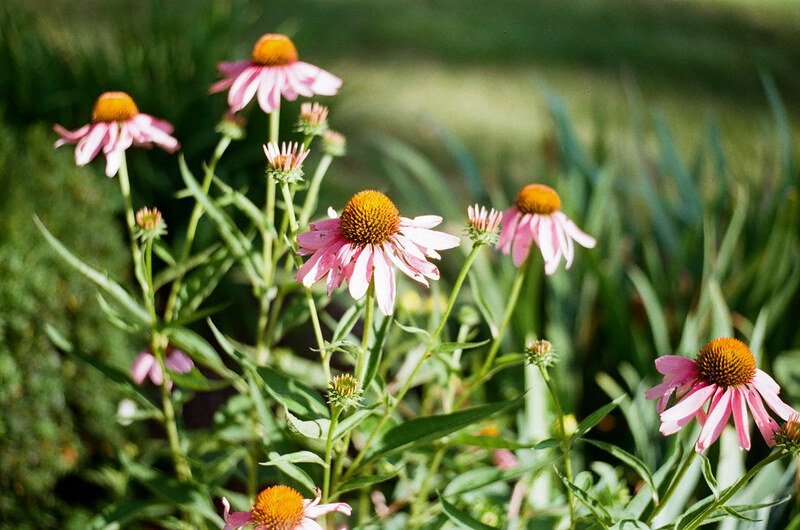 To see more from this camera, check out my Kodak Retina IIc gallery. As you can see, the Retina IIc performed well on the second test roll. I did goof one thing up: I had my meter set on ISO 100 for this ISO 200 film. But fortunately Kodak Gold 200 has good exposure latitude. I adjusted exposure in Photoshop on several images to tame wild highlights and bring out best color, but every frame was usable as scanned. 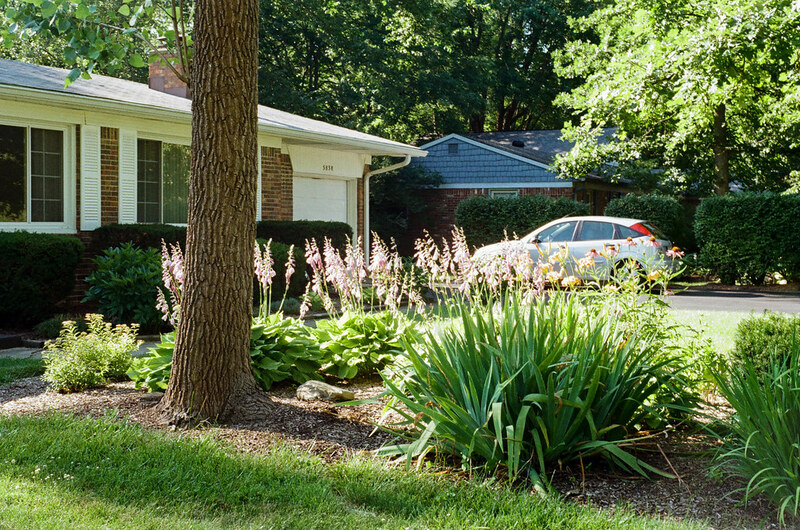 The verdict: as long as you’re metering in EVs, the Kodak Retina IIc is a delightful camera.